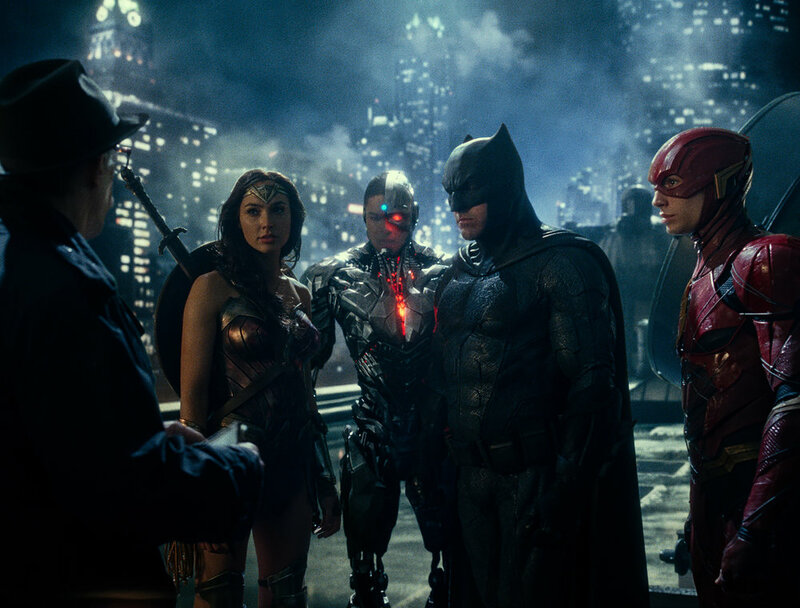 How Green Was My Screen: JK Simmons, Gal Gadot, Ray Fisher, Ben Affleck, and Ezra Miller (Warner Bros.). Early in Justice League, while director Zack Snyder abuses yet another Leonard Cohen song, we see a glimpse of a Metropolis Post front page with a headline about vanished heroes that puts Kal-El in the middle of a triptych with Prince and David Bowie. It feels like a joke from Men in Black (another comic book-derived movie) 20 years ago. Anyway, it's good to see that Metropolis is still a two-paper town. Here's my review of Justice League, where I did not really have room to complain that J.K. Simmons, the J. Jonah Jameson of Sam Raimi's no-longer-canonical Spider-Man trilogy, is now Commissioner Gordon, which feels like double-dipping, or that Gordon has once again been demoted to empty trenchcoat after being a vibrant, fully-developed character in Christopher Nolan's no-longer-canonical Dark Knight trilogy. These movies, man. Merciless Flight: STC's Twelfth Night, reviewed.